The Kick Galvanic: How Much Does an Everest Base Camp Trek Cost? Taking a 5 to 10-minute break in the middle of nowhere. With my porter Dhan Kumar (left) and guide Madan (right). That thing seen at a distance is a suspension bridge. People think an Everest Base Camp trek is costly. I always say it depends on where you're coming from. It's definitely not dirt cheap, but it's something you can realistically save up for. The biggest expense is airfare--so if you live in Asia like I do and you want to go on an EBC trek, consider yourself luckier than those living in North America and Europe. Downtime with Dhan Kumar and Madan. 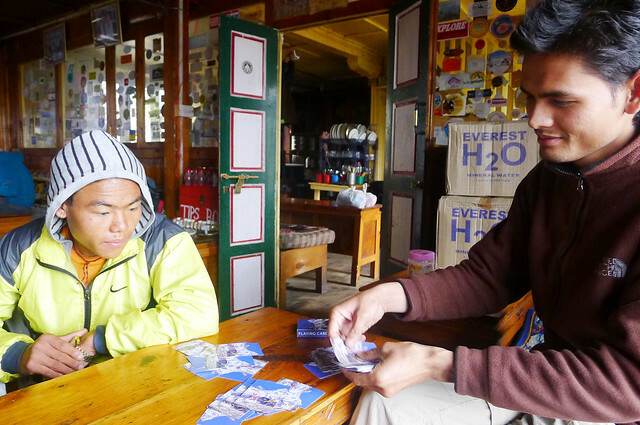 We normally play cards after a day's trek. Standard tip is usually 20%, but if you are very happy with your guide and/or porter, 40% of the total fee would be great. I've been very lucky to have a really excellent guide and porter with me. We ate together, played cards until we couldn't see in the dark anymore, and we laughed on the trail a lot. Sometimes, while waiting for a herd of yaks to pass, we would dance to an invisible beat--or worse, they would teach me a Nepalese trekking song, and I'd fail horribly at memorizing the lyrics. The Nepalis are generally friendly people, so do take some time to know your guide and/or porter. They are going to be, after all, your companions for the entire 12-day trek, so it's good to establish a rapport with them. Side note: Porters usually carry a maximum load of 20 kilos, so in group treks, it is normal for two people to share a porter as long as the combined load doesn't exceed the maximum. I asked Dhan Kumar what's the heaviest non-trek-related load he's ever carried in his life, and he replied, "105 kilos." Super Sherpa indeed. 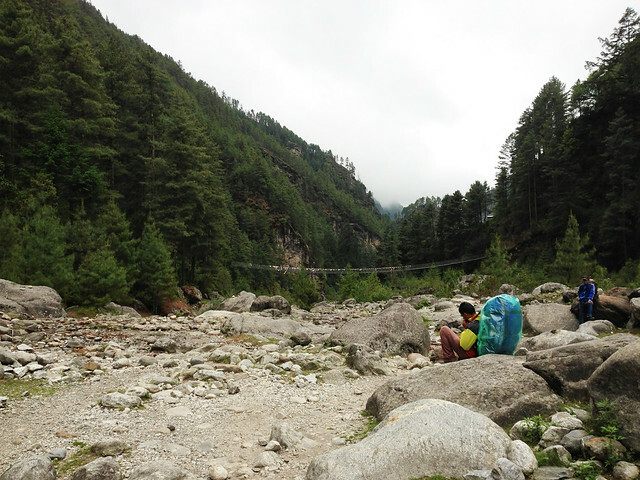 But even if they've been doing this most of their lives, I really couldn't bear seeing so many porters carry heavy packs on the trail, and I felt relieved that Dhan Kumar only had to deal with my 10 kilos for the entire 12 days. Food, Lodging, and Miscellaneous Items. Budgeting for food and lodging can be a little tricky simply because things get more expensive as you go up. A 1-liter bottle of mineral water, for example, can cost 100 NPR (Nepalese Rupees) in Lukla, or US $1, but can go as high as 300 NPR (US $3) in Gorak Shep, past the 5,000-meter altitude level. Everything is carried up the mountains by yak or by Sherpas, so naturally, as goods get scarcer at certain heights, the price goes up as well. would love some eXpresso coffee! teahouse lodging: 350-500 NPR per room per night (w/ shared common toilet & shower) and 1,000-1,500 NPR per room per night (w/ private toilet & shower). But do not expect all teahouses to have rooms with private showers and toilets. Usually, the higher one goes up, the more basic the accommodations are. One to two persons can fit in 1 room, which is normally composed of 2 single beds, a side table and clothing hooks on the wall. a bar of chocolate: I remember paying 100 NPR per bar at lower levels, and around 300 NPR for a bar of Bounty chocolate past Tengboche! Expect to spend US $15 per day on food, lodgings and other optional niceties (as mentioned above) during the first 3 days, and then around US $18-25 per day as you go higher. 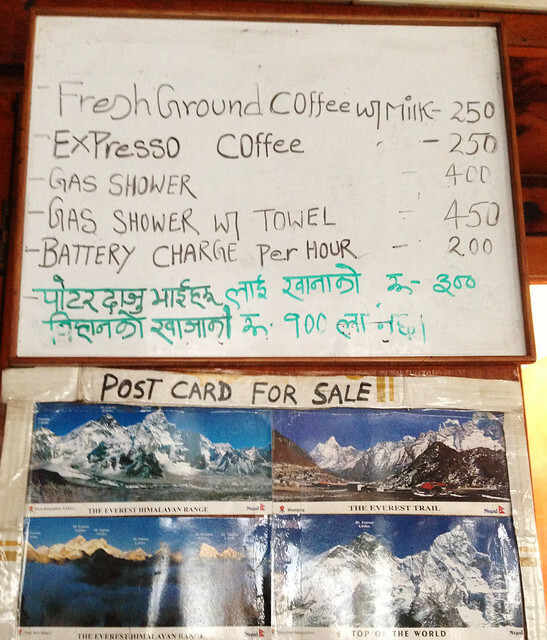 Again, these are estimates, as the prices are not all the same as you go up and down the Everest trail. It's okay to have a tight budget, but try and 'treat' yourself to something nice once in a while (like a hot shower or a pot of tea). When you're tired from a day's trek or just feeling really crummy at some point, it's the little treats that help you feel better. Other Expenses. A roundtrip domestic Kathmandu-Lukla flight costs around US $324 (new rate as of September 1, 2013), while costs for trekking cards and entrance fee to the Sagarmatha (Everest) region vary, depending if you're trekking independently or through an agency. The required Trekkers' Information Management System (TIMS) card can be acquired at Kathmandu or at a sort of registration/check point in Monjo before reaching Namche Bazaar. This card allows the government to keep track of all trekkers within the Sagarmatha Region for safety reasons. 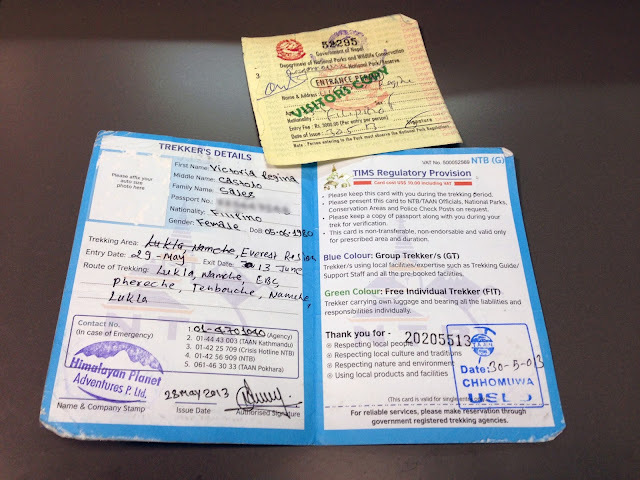 A blue TIMS card like mine (around US $10) is issued to trekkers using the services of a trek agency, while a green card (around US $20) is given to independent trekkers. The yellow slip is the entrance permit which costs about US $28 (3,000 NPR). and nobody wants to broadcast that kind of photo to the rest of the world. And don't forget to buy travel insurance before setting out on a trek. I paid US $95 for World Nomads travel insurance, which is recommended by Lonely Planet, as this covers adventure sports and activities such as hiking up to 6,000 meters. Good for you if you can find travel insurance in your own country that supports such 'risky' activities. I couldn't find any in the Philippines! Fortunately, you can buy a World Nomads insurance policy online, even on the day before you travel. So what's the total? If you do end up trekking independently (meaning you hire your own guide and/or porter, and do all food and lodging arrangements by yourself) and not go through an agency, you'll spend a total of around US $1,000-$1,250 on the Everest Base Camp trek, excluding international flights and hotel/hostel lodgings in Kathmandu. The said trek costs can go lower if you share a room with someone. P.S. If you live in Asia and you're looking for budget airfare to Nepal, AirAsia offers the cheapest flight I've seen so far via the Kuala Lumpur-Kathmandu-Kuala Lumpur leg. Now, all you have to figure out (if you're not based in Malaysia) is to find a cheap plane ride from your own country to KL. FYI, I traveled via Thai Airways, but in hindsight, I should have done the whole AirAsia thing to save more on costs. What I spent. To be honest, I learned about some of the above-mentioned prices by asking fellow trekkers while I was on the trail; I also took down notes on costs of food and miscellaneous items I saw on teahouses along the way. However, I did not trek independently because I opted to have all logistics done through a local Nepalese trekking agency, Himalayan Planet Adventures. Arranging things through an agency is admittedly pricier, but it was the right decision for me. I did not want the hassle of looking for my own guide and porter, nor did I want to find a teahouse at the end of each trekking day and settle the bills for food and lodging every single morning. You can also arrange with your local trek agency to offer 3-star Kathmandu hotel or hostel lodgings in the package instead of 4-star/5-star accommodations. They are pretty flexible and can handle reasonable travel requests easily. Miscellaneous expenses I shelled out personally were mineral water, hot showers, energy treats (like chocolate), toilet paper, battery charging and Wi-Fi. Depending on how much of a shutter bug you are and how long your camera battery lasts, expect to charge 2-3 times on the way up to base camp. Better yet, bring a fully-charged spare batt to save on charging costs. To each his own, really. To me (and I'm sure other trekkers would share my opinion), there is great value in going through a local agency. But not all trekkers are the same, nor do we all have the same kind of budget or the same idea on how an adventure like Everest Base Camp should be. Some even choose to really rough it and go camping all the way up! (Which is surprisingly MORE expensive than the regular teahouse trek, by the way.) So choose whichever trekking option suits you best. A typical teahouse common dining hall. Food is cooked and served here. Great description. Please click the link Everest Base Camp Trek for more details. Naba - Adventure Consultant @ Himalayan Planet Adventures P. Ltd.
We (a couple from Sweden) did the Everest base camp trek in late Oct- beginning of Nov 2013. It was great! the main trekking season, but we still had really nice weather and nice days in the mountains. We flew into Lukla and hiked for a total of 12 days. Our original plan was 13 days of trekking, but due to bad weather we were delayed for one day on our way to Lukla. Since we missed one of our acclimatization days, our trek became one day shorter and we did not make it to Kala pattar or Everest base camp. If it is important for you to reach base camp, you have to make a deal with your Independent trekking guide ; otherwise you will not be able to reach your goal without the risk of getting altitude sickness if you are short on days. On our way down we walked to Khumjuung and visited Khunde, which we really liked and recommend. We used the guide book “Trekking the Everest Region” by Jamie McGuiness, and we really enjoyed to read it during the evenings. Am currently sitting in Lukla (the worlds shortest runway), waiting till tomorrow for hopefully clear skies and takeoff back to Kathmandu, what an adventure I have had here in the himalayas for almost two weeks!!!! After googling reviews and emailing a few tour operators, I decided to go with Sanjib Adhikari from www.nepalguideinfo.com. Email sanjib-adhikari@hotmail.com Best decision ever and after making friends along the trek who were unhappy with their guides they have also decided to employee Sanjib on their next nepal trek. Having an experienced guide (over 150 trips to EBC), he made our time, informative, stressfree. We got headaches like most trekkers, but didnt suffer altitude sickness as we were continually monitored. The best thing about having a guide is having everything taken care of for the whole trip, not worrying about flights, passes, meals, nothing.. just enjoying the journey.. and what a journey.. The weather changed with the days and well as the scenery, so pack for all conditions, but dont worry you can buy or hire everything in Kathmandu or in Lukla or Namche Bazaar along the way. We took 12 days because we had a short time frame, but most people seem to take 14 days for the EBC trip. Everyday of the walk is different and beautiful with only two of the days being somewhat harder than the rest, but manageable. I dont think this will be my only time to the himalayas, I now want to trek the Annapurna trail. This place is magical. I recommend bringing baby wipes,tissues and antibiotics and nurofen. I highly recommend this trip and again Sanjib Adhikari made the trip run so smoothly, he is such a hardworking man who started as a porter and now is an amazing guide. 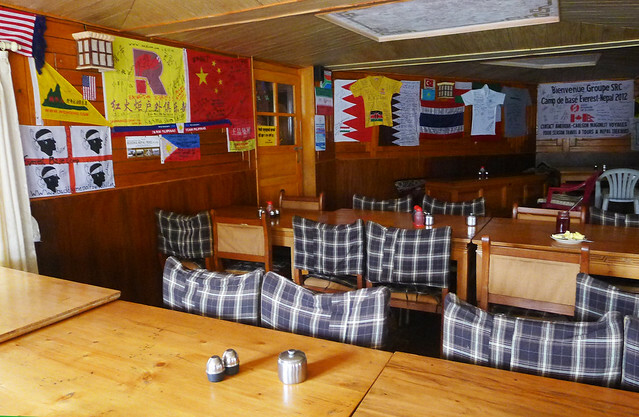 Thanks for writing your experience about Everest Trekking. You see the incredible, royal, and the best creation of Mother Nature standing right in front of you and that is “Mount Everest”. You get ultimate experience of Everest base camp trekking with www.gofornepal.com. There are several trekking holidays in Nepal with numerous option of mountain to be chosen. Among all those available Top 5 best trekking in Nepal Himalaya can be shorten out. Although it depends on several factors like time, budget, stamina etc. Everest trekking is always dominating, followed by Annapurna, Langtang Manaslu and Kanchenjunga Trek. Out of these Top 5 best trekking in Nepal Himalaya Manaslu and Kanchenjunga needs special permits where as general TIMS card and conservation area permits are ok to trek rest of the area. We found Nepal Planet Treks among other companies from the web and were finally made up my mind to use their service due to very prompt and personal reply from Sanjib by email and Skype. During our trekking we felt like giving up due to unexpected weather conditions and long hours trek but we still made it in the end thanks to Ram, the warm hearted guide whose friendly demeanor made the trek more enjoyable. The porter Neem is also a great boy with polite and humble disposition. All in all we enjoyed our trek and their accompanies much and satisfied with all the arrangements. Given chances we would like to trek in Nepal again with them next year. Treks Himalaya an indoor outdoor trekking and tours Operators takes you that further way to guarantee you has an unforgettable adventure Trekking in Nepal that you have been dream with Acute trek is part of your choice for Treks Himalaya. We have your choose of trekking for 3 days or 30 or more days it depending of your timetable, sleep under lodges or tent. We always respect our duty to constantly your holiday satisfaction in Nepal. Whether you are looking for a quiet gateway, a memorable Hiking in Nepal outing with a family or an exciting nature adventure with Acute Trek Pvt. Ltd.. We offer you with the best progressive information and itinerary leading focused and modified as per your requirements. It is significant to memorize, though, it necessitate an enough level of physical homework and must remembers that there is also a psychosomatic assurance walking and Trekking in Himalaya. Acute trek is an attempt to encourage Nepal to the exterior world while striving to defend an aged tradition as well as conserve the surroundings for generation to come. We are specialize in organize Nepal travel activities excursion such as:- Trekking, Helicopter Tour, Peak Climbing, Mountain Flight, Honeymoon Tour, Sightseeing, Rafting, Jungle Safari, Pilgrim’s Tour, Hotel Reservation, Air Ticket, Tibet and Bhutan Tour many more your vacation desire. Himalayan Spirit Adventure is well known and dedicated local trekking and tour agency of Nepal. We did more than 20 years experience for the development of the tourism in Nepal and get proper knowledge in trekking in Annapurna, Everest region and Langtang region and many more trekking destinations all over Nepal. Himalayan Spirit Adventure is registered trekking agency affiliated with Trekking Agency Association of Nepal. And associated with Nepal Association of Tours and Travel Agents (NATTA), Nepal Tourism Board ( NTB), Nepal Mountaineering Association (NMA), Kathmandu Environmental Education Project (KEEP) and International Porter Protection Group (IPPG) As a leading agency we have social responsibility too. In some distinct and V.D.C we have been supporting many children and poor people for their change. Himalayan Spirit Adventure believes on team works and practical knowledge of the objects. The team of our company experience as the porter and guides. After long exercise in trekking and tour we have established Himalayan Spirit Adventure for our costumers' interest to enjoy in Nepal. From Manager to general staff of the company are well trained and experienced. The qualification in the related subject matter and long experience in the field make secured each and every trekking and tour enjoyable and unforgettable. Most of our guides are trained from the government authorized organization. Although we have specific guide in famous and easy as well as difficult route. You can choose the guide whoever you like in your pleasures trekking and tour which is mention in the profile of our entire team. Annapurna, Everest and Langtang are the classical route simple guide can lead you but we never compromise in service that’s why we refer you the professional one. Professional guide helps you to explore the things and culture in particular areas. 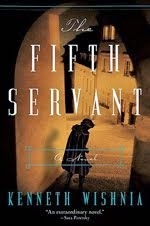 Moreover, he/she suggest you for upcoming dangers and fortune of the route. Finally, we always waiting for comments if our service would not satisfied you according to contract. Hope you can do proper enjoy in Trekking, peak climbing, adventure sports, tour program with the coordination of Himalayan Spirit Adventure. Our trekking with kamal was more than an amazing experience and kamal is more than a wonderful guide. He will help you choose the best trek for you, by taking into account your interests as well as your physical condition. He will show you all the hidden beauties which characterize Nepal and its mountains. Consequently, at the end of your trek, you will recognize all the plants, trees and animals and will have incredible experiences to tell your friends. Thanks to kamal, we have been able to experience few evenings among native Nepalese people with whom we have shared a glass of the local alcohol and food. Everest Base Camp Trek starting from INR 35000. Get quotes from multiple operators for your requirements. Compare easily and book your trek from any operator on Mojhi. Nepal, Himalaya, kathmandu is the beautiful tourist attractions place for holidays. Greater Nepal Adventure Holidays, Nepal Tour Packages Operator, Tour Agent, Nepal Himalaya, Kathmandu tour package, Tourist Attractions Place, Dolpo, island Peak, Sightseeing Tour, Jungle Safari, Nepal Tibet Bhutan, Itinerary Travel Guide.